Even though AIM provides products that can be taken with most others, two AIM products really don’t get along. Like two talented people who cannot work together but individually produce excellent work, AIM FloraFood® and AIM PrepZymes® must be kept separated to be mutually effective. 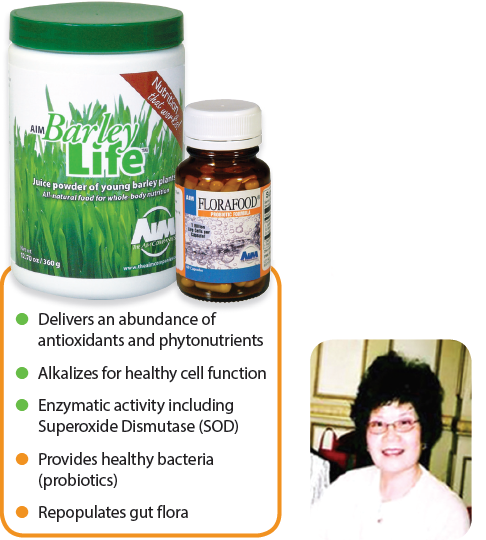 Both work wonders for your digestive and immune systems, supporting overall good health. The enzymes in PrepZymes not only help to digest food, they provide supplemental enzymes needed for literally thousands of essential chemical reactions in your body. The friendly bacteria in FloraFood promote a healthy balance of intestinal flora and pH, while helping to produce vitamins and maintain healthy cholesterol levels. And that’s just the tip of the iceberg when it comes to the benefits of these natural health products. But if you take FloraFood and PrepZymes at the same time, the internal battle begins. Without perceptive brains (or any brain matter for that matter), enzymes simply start to digestively devour FloraFood, destroying the equally brainless bacteria that have only your healthy interests at heart. What a waste of effort (and money)! Taken separately at different mealtimes allows FloraFood and PrepZymes to get their work done without any mean-spirited interference or supposed superiority. So if you take PrepZymes with breakfast and dinner, take FloraFood with lunch and a snack. Whatever you do, just keep ‘em separate. They just don’t get along. And they never will. I hope people can benefit by reading my testimonial. I live in the small, quiet town of Hillsborough, New Jersey. Twenty years ago, my friend introduced me to AIM’s green barley powder, and I haven’t gone a day without it since. Before becoming an AIM Member, I usually had a sore throat or an infection of some kind. Now, I rarely catch a cold or have a sore throat. Here’s another interesting thing: I don’t have to dye my hair. It is shiny and black, the color of someone twenty years younger. I believe this might be due to my persistent use of AIM BarleyLife®. I am very grateful for AIM’s FloraFood. I believe it alleviated my suffering and made my recovery from herpes much quicker. A month later, I was able to help a friend who had poison ivy all over her feet and legs. I immediately told her about FloraFood as a solution to her poison ivy problem. I gave her capsules. Two days later, I followed up with her and her feet were much better. In the New Jersey springtime, many people are aggravated by hay fever and allergies as well as poison ivy and other plants. I recommend everyone take advantage of BarleyLife and FloraFood for protection against those threats. That way you can enjoy all the flowers in bloom. Finally, I am grateful for the research done by The AIM Companies™. They have come up with so many superb and beneficial products. In the past decade, so many different health food supplements have appeared in the marketplace, but I have never lost my faith in the AIM products and will never give up the privilege of using them. The AIM Companies has given me unexpected health and happiness. Note: Emily Liu takes AIM’s Garden Trio® and CalciAIM™ as her morning drink. She also uses AIM Proancynol® 2000, CellSparc 360®, and AIMega®.